People demand a lot from marketers these days. Marketers aren’t just expected to generate more leads, they’re also being asked to create more engaging experiences that convert visitors every time. That is, of course, far easier said than done. It might seem like creating these win-win scenarios–when your audience is satisfied with an awesome experience, and you get the lead information you need–is like finding a four-leaf clover. But it doesn’t need to be that way. Fortunately, interactive content makes a marketer’s job just a little easier. Interactive content is an experience where individuals can participate with the information they’re consuming, creating an immediate two-way dialogue. It can come in many forms–a knowledge quiz, persona assessment, a poll, or a dynamic ebook or whitepaper with questions layered in. Not only is interactive content quick and fun for prospects to interact with, it’s proven to be effective. The average reported metrics from SnapApp users include a 30% click-through rate, 85% completion rate, and 45% lead conversion. And, perhaps best of all, it can be fully integrated with your digital or engagement marketing platform. This first step requires some big-picture thinking. Before you get into the specifics of creating an interactive asset, determine what you’re looking to get out of it. Are you looking for better engagement from new visitors and early-stage leads? Or are you looking to weed out lesser qualified leads? Maybe it’s re-engaging dormant leads in your database? Engage new leads with a Department of Letter (DOL) calculator that reveals how they could be affected by new regulations. Learn more about leads and their individual work habits and time spent on processes with a time savings calculator where prospects enter their information. Guide late-stage leads to the most fitting solution by asking them specifics about their company size and top priorities. It’s important to consider interactive content as a part of your larger content strategy and its goals and objectives. Because interactive content is a newer medium, it can be helpful to use a planning guide and campaign outline as a springboard to get started. Another key starting point is understanding subjects and themes that resonate well with your audience. After all, regardless of what segments you’re targeting, they are simply made up of walking, talking people who have a broad range of interests, even outside their industry (gasp!). Once you determine the different topics that will engage your target audience, you can move on to choosing the specific content format and theme of your interactive content. As we saw above, calculators and product pickers are options to help demonstrate a value point of your product or service. However, these can come in a variety of formats. Think of interactive infographics used by The New York Times, or more fun-focused assessments and quizzes published by Buzzfeed. One of the biggest benefits of interactive content is that you can collect valuable information about your leads to pass on to your sales team, without being too obvious or pushy. For example, we created a personality test based on Game of Thrones. We went with this theme for two reasons. The first is that in March of that year, we launched an interactive bracket about marketers’ most binge-worthy TV show and Game of Thrones won. And the second is that the new Game of Thrones season was starting at the time of the assessment, so it was top-of-mind. 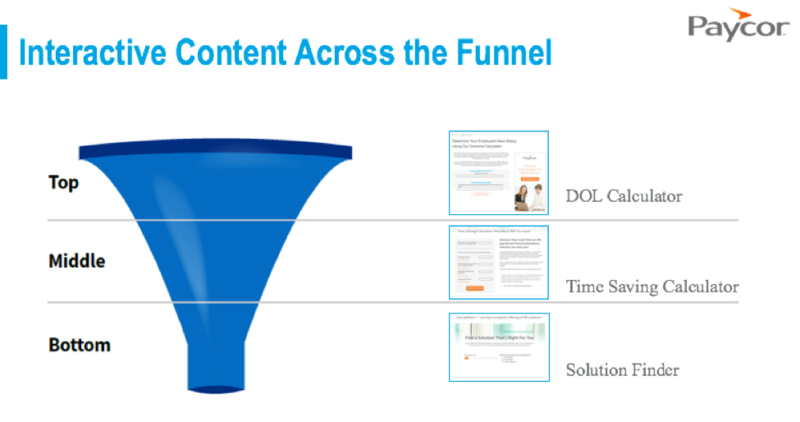 On a standard static-content campaign, what’s the typical practice? Usually, marketers promote their assets across social media or in emails or blog posts that lead to a landing page. On the landing page is a lead form that visitors must fill out to access the content, such as an ebook, whitepaper, or infographic. Some lead forms are neither enticing nor effective. Most of the time, marketers can only collect a few fields of lead information (anything more increases the bounce rate). Ask questions that tie into your theme. 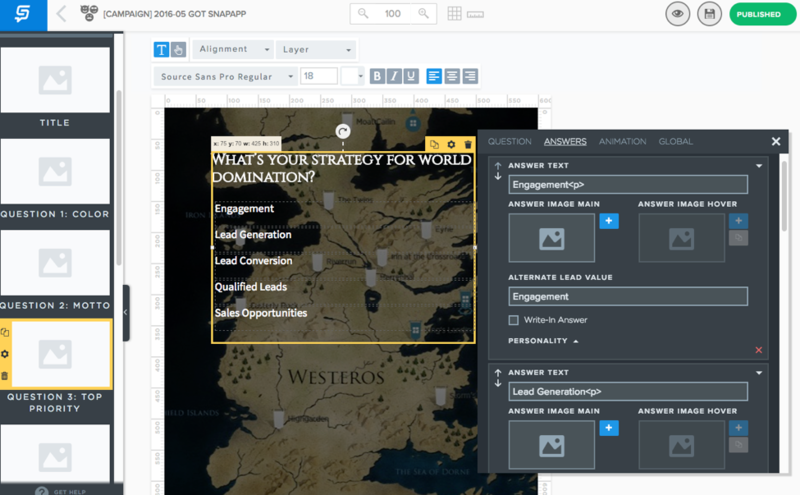 By finding ways to connect the prospect data we wanted to collect with Game of Thrones, we created an engaging experience for users that ended in a personalized result for them. 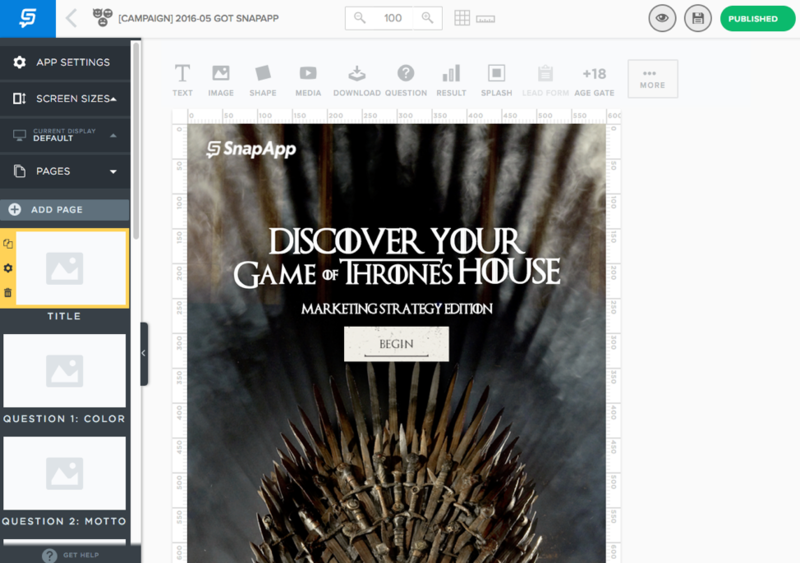 We scored our prospects’ answers to tell a user which house they belong in (House Stark, House Lannister, etc.). Their information was synced into our marketing automation platform to update our database and inform our segmentation, scoring, and nurturing tracks. Each answer helped us understand our lead’s top priorities, which informs their nurture content and gives our sales team insights for future conversations. Place the lead form strategically. Of course, you can still leverage a lead form if you’d like, and it can be much shorter. With interactive content, you can choose where the lead form will live in the experience and what type of information you’ll ask. Positioning a lead form directly before a results page boosts conversion because your prospects have already invested their time, with a personalized result in close reach. Combine your interactive content with an integrated marketing platform, and you can do so much more. For instance, if you are using Marketo’s Munchkin code, your known leads will have their contact information preloaded into an interactive experience. This allows them to skip the lead form altogether. Their answers are sent to your database, but they don’t get interrupted by a lead form. An engagement platform, like Marketo, should be the heart of your marketing efforts. Therefore, all the information you collect from your content should flow seamlessly from your content marketing platform to your engagement platform and vice versa. To accomplish this, add the content you create in your content marketing platform into a specific marketing program. Within that campaign, you can direct and use the information you collected in any way you want. For example, if a prospect identifies as a content marketer, we’ll send them helpful information focused on content. If they are more involved in marketing operations, we’ll focus on that subject instead. Think of how you can assign different subjects to different personas in your own strategy. What does this integration look like? Check it out below. Bonus tip: Once you’ve synched your content marketing platform with your marketing platform, you can leverage the valuable information you collected in a follow-up email. 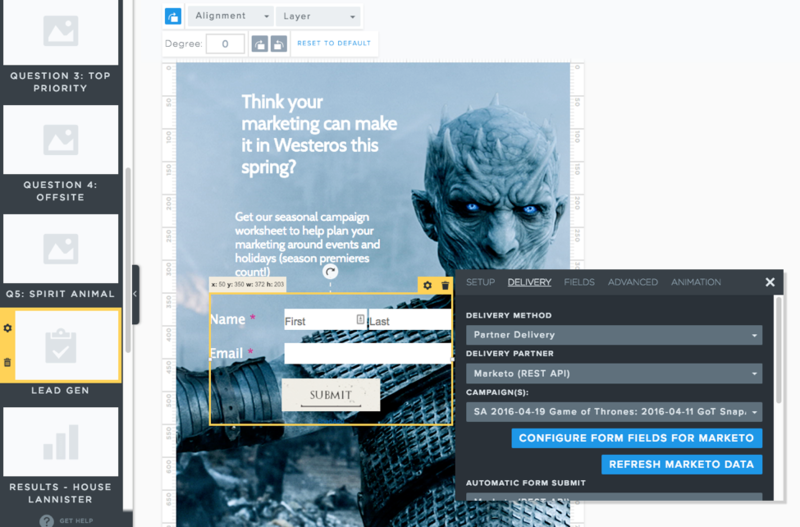 For example, we used dynamic content in our follow-up campaign to call out which Game of Thrones house prospects were assigned to during the assessment. We tailored the email copy to match the house’s description and suggested how our platform could help with their priorities. All of these steps combined–from initial ideation and goal definition to theme selection, promotion, and personalized follow-up–creates campaign cohesion across your revenue teams. However, this only scratches the surface of interactive content. As you get used to the medium, you can improvise and optimize in numerous ways. Have you already had success with interactive content? 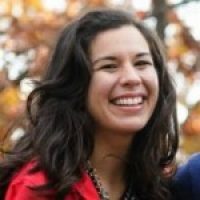 Have a question about how to get started? Start the discussion in the comments below!